At our I2020 presentation last week, we had a lot of great discussion about the data. One topic we discussed was representation in arts, culture and creativity. While a large majority of Denver residents in our survey believed that people like them participate in arts, culture and creativity, African American and especially Latinx residents were more likely to doubt that people like them participated. Even a small difference can be important, though, since people might use representation to infer other things about an organization and its events, such as whether an event is welcoming, whether they have the right background knowledge for an event, and whether an organization is relevant to them. Also, representation is important because it’s something that organizations have some control over, especially representation within their boards and staff. Quantitative research is really useful for understanding the “what” of a topic. To get to the “why” though, you really need qualitative research that gives people space to explain things in their own words. We hope the results from this I2020 survey inspire Denver organizations to start digging into the “why”. To view the presentation, click here (PDF). 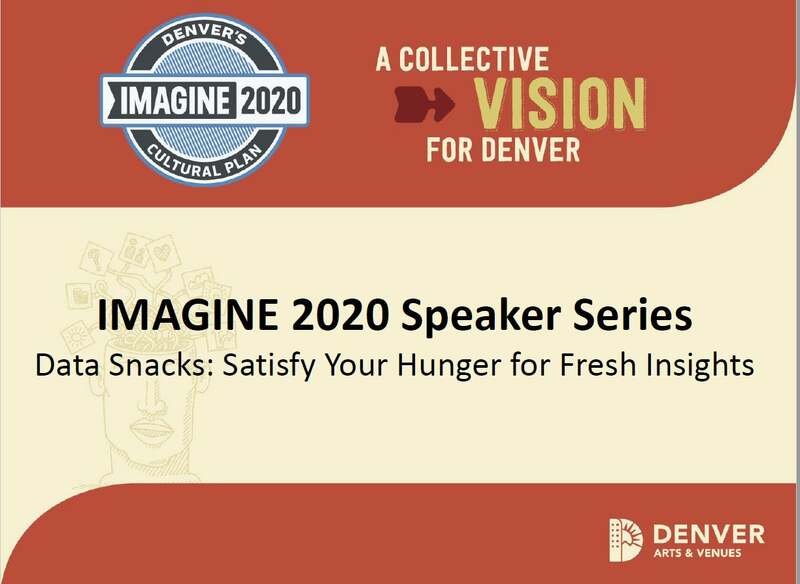 To learn more about Imagine 2020, including additional research, click here.